Those same things are also happening with a converted version of the EEC GT3 mod as well as a convert of SidStalker's V8SC mod. It is weird because if I go on Time trial all the cars load instantly and work fine, even with AI! For sure, Teddy, our old Guru, GeeDee, may help you, I hope. He knows everything and more. Try him in a PM. Good Luck, buddy! Cheers! will do, but first: IMSA! Properties and in the Target line, type in +fullproc trace=1 as shown in red. UserData folder, go into the Log folder and open the trace.txt file. That's where all will be revealed (in most cases) as to why the game crashed. usually reveal anything that caused the CTD. AnimationAct 204: GMT and EFX meshes diff too much. steward.cpp 1403: Could not find light "PTLIT02"
Satisfy these needs and try loading the game again. Not sure about the .HDCs and .HEDs, but the missing .CAS is definitely a killer. You've got yourself a rogue driver body. It's different than the original GTL one and the animations don't match. 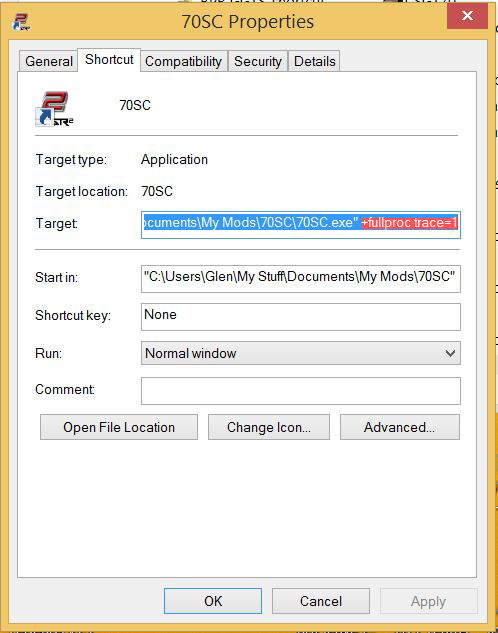 You need to copy the Instances EXTDRIVERBODY and FPDRIVER from an original GTL car .cas file. It's the easiest solution that I see to this part of your problem. - You can download the GTL-GTR2 mod and look for the file. - You can copy your own headphysics.hed, rename it and place it in the Teams folder. - You can check all the .car files and edit wherever you find the wrong headphysics. You just need to change HeadPhysics=HEADPHYSICS_GTL.HED for HeadPhysics=headphysics.hed. I think that you copied a Camaro skin into a different folder. Or it maybe is a skin for a different Camaro, for another mod. Do these file names sound familiar to you? That may be there for a couple of reasons. Best course of action: remove all your car folders, except for the Skoda 130 RS and load the sim. - If the error is gone, you copied a skin in the wrong folder. - If the error is still there, check the Skoda .car files and look at the section HDVehicle=, one of them is not OK. Correct it and reload the sim. If the just corrected skin looks funny, it's not meant for that mod. That looks like a rooting error. It might be caused by a typo in one of the .cas files. That's a classic too. Some tracks cause that error, but it doesn't seem to have any effect beyond the annoyance. okay, all solved except the .HED thing, there seems to not be a mention of a .hed file in the cas, not even in the original GTL cars. Sure, if the cars have paddle shift they probably won't have the ShiftStickPosition stated, they wouldn't have any need of it. It's not a critical error anyways, it won't ctd your race, you can ignore it just like the PTLIT02. "vehgfx.cpp 2552: Unable to read USERDATA\LOG\vehgen.scn: Error loading global material WC_DRIVER_ARMS" just out of nowhere..
Have you changed TALENT.GTR for TALENT.GTL in the .cas file that you edited? I'm assuming that the car that you imported the GTL driver bodies for is the one nagging now. You will be forever trying to sort this out sounds to me as if something in the game files have got cross linked or corrupt as a last ditch attempt delete your driver profile and create a new one sounds daft but has sorted a lot of problems for me. tedious I know, but worth it in the long run. you can use your GTL cars just change the .gtl extension's to .gtr and class lines. I think there is a tutorial on here of how to do it. The headphysics.hed error just removes the head movement in cockpit view, it's not critical either. I don't think setup.cpp 1088: Could not find .HED is about that. Can you send that car to me? I can give it a look. ShiftStickPosition just sets the position of the gear lever, which is like saying that rules the movement of the driver's hand during the gear shifts. If it's not stated in the .car file, the driver's hand just doesn't recieve the command to reach for the gear lever when shifting gears. It's not dangerous. I used to convert formulas from the 90s and 2000s. Many of them had the same sort of gear levers and the cars worked in GTL despite not having stated the ShiftStickPosition. Are you sure the ctd is its fault? If so, you can always set the gear lever position to just after the steering wheel, where one of the paddles should be. It kind of looks like. However, although it may take you a while, you can fix everything. It's just a question of patience, and you learn a lot when you deal with crisis. It's just a question of patience, and you learn a lot when you deal with crisis. That is very true, I've now established that all the issues come from cars at random , as I've just raced agaist a car (speedster63's Renault RS01 to be precise) that caused the game to ctd the next time around, it even was the same team, a single car one at that! steward.cpp 1403: Could not find light "STLITE"
steward.cpp 1403: Could not find light "PTLIT01"
Are these the same changes that you did? » Do we have a pc experts here overlock experts? ?